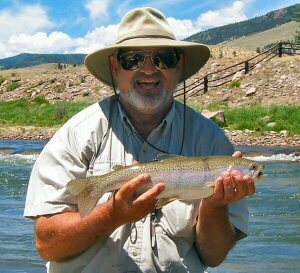 Frying Pan Anglers Guides - Guided Fly Fishing Trips for trout, Aspen Fly Fishing on the Frying Pan for trout at Basalt, Aspen Trout fishing on the Frying Pan Roaring Fork fly fishing float trips, Colorado." We provide wade trips every day of the year if anyone is interested in trout fishing. The depths of winter attract only the hardiest souls, but the trout fishing can be fantastic. 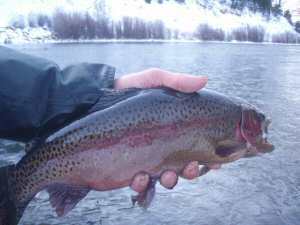 Take a look as our collection of Winter photos for a taste of the trout fishing opportunitities. On one day ski Aspen guided fly fishing trip the next. And then of course we have spring summer and fall. Given that most wades are in the warmer months, we will outline aspects of a full-day Basalt or Aspen guided fly fishing trip. Generally we like to meet the client at the shop first thing in the morning to make sure that all the relevant paperwork is completed. That will include a license and relevant releases. If you have your own trout fly fishing equipment, then you don't need much more. On the other hand, we have an extensive range of fly fishing equipment depending on the weather and the fishing conditions for your Basalt or Aspen guided fly fishing trip. The guide will then take you to the spots he considers will fish best for the day. If you want to fish both the Roaring Fork and the Frying Pan on the same day, that is easy as the Pan is 14 miles to the base of the dam from Basalt. So from anywhere on the Frying Pan below the dam is it just a matter of getting in the car and going back to Basalt and then traveling up or down river to fish the Roaring Fork. There is very good trout fishing on the Roaring Fork from Aspen to Glenwood so there is not a great deal of traveling involved. On a full day Basalt or Aspen guided flyfishing trip the guide will provide lunch and refreshments. You may take your trout fly box along and try your patterns. Alternatively the guide will be carrying a good selection of trout flies which he knows are working. If you have a little difficulty getting around, let the shop know in advance so that your guide can plan in advance for easier access points to the River for you. Generally the Frying Pan can be waded all year. However if a big water release occurs when a call is made mid-summer, the wading can be a little tricky and not something to try if you are not confident wading on a rocky bottom. Furthermore, earlier in the year coming out of winter and spring the rocks tend to get a little slippery from the build up which occurs in the slower water flow. It takes a little while for the higher flow to clean up the bottom. On a full day Basalt or Aspen guided fly fishing trip you will enjoy at least 8 hours on the waterfishing for trout. In summer the evening fishing can be fantastic so if you want to fish a little later, you can make the relevant arrangements with your guide. We will get you back to the shop for your transportation at whatever time you nominate. If you would like to take some of our better quality rods for a road test, make the relevant inquiries when booking your trip. It is a great chance to try out some truly good equipment if you are in the market for an upgrade. Make sure you take your camera along. We will happily post digital photos on our website so you can show your buddies that you were serious about your fishing trip. Back to Guide Trip Rates.